THE DEADLINE FOR the most sought-after tickets in Ireland is today. 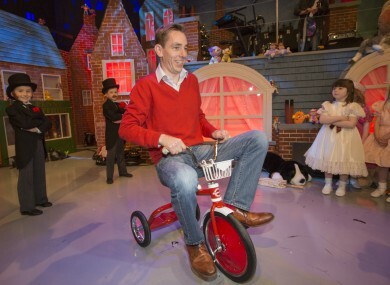 Demand is always high for tickets for the Late Late Toy Show, which takes place on 28 November, but this year demand is up again. Speaking on RTÉ’s Morning Ireland this morning, the show’s host Ryan Tubridy said that demand this year was far above last year, when 40,000 applied. Tubridy says that from mid-October the only question he is asked by members of the public is about tickets. To apply, go here and fill out the form, but note: multiple applications will get you disqualified. However, with 100,000 people applying for 200 tickets, you have a 1 in 1,000 chance of getting you hands on a pair. Here are some things that are as or more likely to happen. Email “Looking for Toy Show tickets? The deadline is today”. Feedback on “Looking for Toy Show tickets? The deadline is today”.